hosts, creating scrapbooks with recipes taken from the internet: All you need to have is a printer. Sometimes you care so much about attractive recipe pictures that you want them printed in colors before sticking them in your scrapbooks; It has the advantage of saving budget on recipe books. But, It’s often a temptation to grab some recipe books with imposing photos. And you often find such books are not that costly, plus sometimes they are not sealed; so you flip through, make a halt on one or two pages of interesting recipes to read a bit more about them. The instructions are often simple, well at least they sound so at first. And you decide to give it a try! buy the book, and start cooking in your lovely kitchen. See! how big your desire is to the art of cooking. It’s hard to say NO to tasting new food (as long as the food doesn’t fall into a category of “against my rules of food”), but the joy of tasting new food won’t be as excited if I skip trying how to make it, especially if the taste of the food linger on in your mind over and over again. Of course, it’s not my rule to try each new food I just taste. But, I do it sometimes. So, what happened with you after you bought the recipe books? The urge of reading the recipe books you just bought is so powerful that you are ready to pack your bag, and go shopping to buy some ingredients needed for the recipe(s) you urge to try. And try the recipe ASAP! 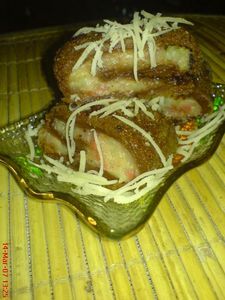 Considering over thousands of recipes, the option finally falls into “Cokelat Kentang Gulung” or “Rolled Chocolate Potatoes”. The instructions are read, the ingredients are bought, the kitchen is even twice readier than you. You start reading the instructions slowly. They only list a few numbers of instructions! how neat, easy and quick! snap your fingers as you get the whole idea on how to make it. You thought you have measured everything correctly, but why the great-food-to-be turns out to be disaster-food-to-be? The temperature inside’s getting high, you’re sweating, hungry, tired, and perhaps cursing the author of the book for not giving any detailed instructions. Your lovely kitchen become a bit messier than usual time when you use it. You convince your self that it’s your first time trying the food, so it’s kinda usual to have some failure. But you are nearly done! Go on! Voila!! Your efforts pay off! The Rolled Chocolate Potatoes are ready to serve. A long sigh of relief is heard the entire room! Does it sound so complicated? Well, in fact some recipe books don’t really tell you detailed instructions. For beginners, reading these instructions may not be easy. They will end up in frustration- OK this word is a bit too much, isn’t it? heheh. They might not consider putting this recipe into their favourite lists. Lucky for advanced people who are used to spending their time in the kitchens and trying different kinds of food from A to Z, from East to West, from common ingredients to rare ones. These people have the ability to absorb information ( in this case, instructions) easily. They are experienced enough to know the Don’ts and the Do’s over mixed ingredients. But there are some people who are blessed with talents in this field. Their “status” are not beginners, but directly on advanced levels , which mean they manage to succeed in their first try. I’ve been thinking, more like a group of rhetorical questions to self. 1. Is it your capability of understanding to-the-point instructions? 2. Is it your blessing to be born as talented ” reputable chef”? 3. Is it your experiences? 4.Is it your determination to succeed? 5. Or is it just the recipe books / instructions to blame?